If Failover Cluster Manager is used to modify the VM configuration while the VM is clustered such as adding a Network Interface to the VM, “Refresh Virtual Machine Storage Configuration” errors may be generated and the VM will fail Quick Migration and/or Live Migration to another cluster node. All three criteria must be met for this error to occur. 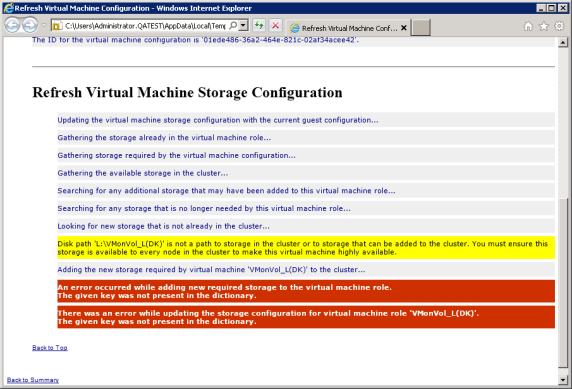 This error does not occur if Hyper-V Manager is used to change VM network configurations when the VM is out of the cluster. Be sure to expand the hotfix selection choices (“Show hotfixes for all platforms and languages”) so that the hotfix for x64 platforms is displayed.